Your current license will work with all 4.x ánd 5.x versions. All existing 4.x customers will get 5.x free of charge. You can use the same license details. We've added a new sort option: "Value, ignore minus sign (-) in numbers"
This will sort your numbers ignoring the negative sign. Positives and negatives are sorted as the same, which can be helpful for reconciliation (accounting). We've added a new sort option: "Reverse order"
This will reverse the order of the data, independent of the values in the cells. 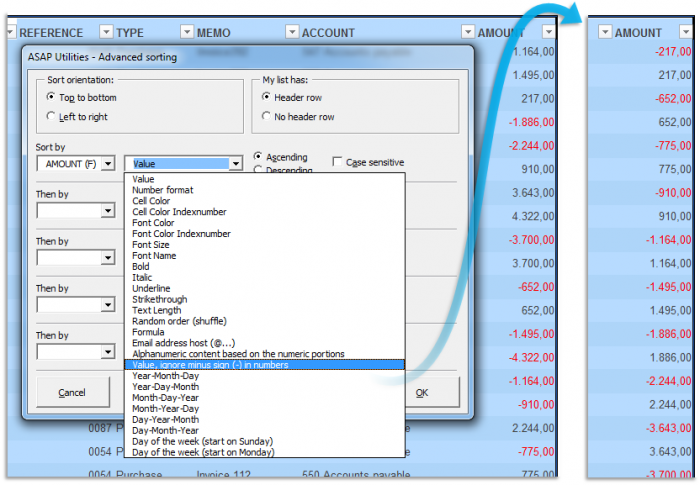 You can use it to flip entire rows vertically or columns horizontally. so that bottom becomes top and top becomes bottom for example. 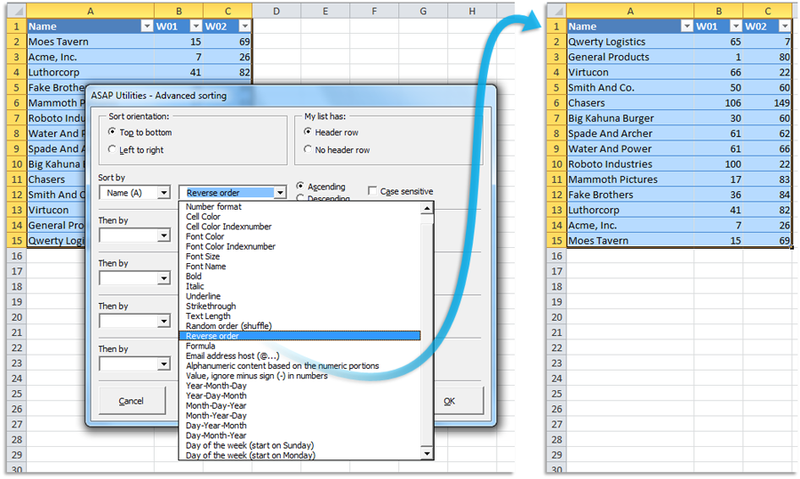 Count and color the duplicate values in your selection where each set of duplications gets its own color. (As long as there are enough distinct colors available to see the difference. If there are too many sets of duplicates then you will be notified). 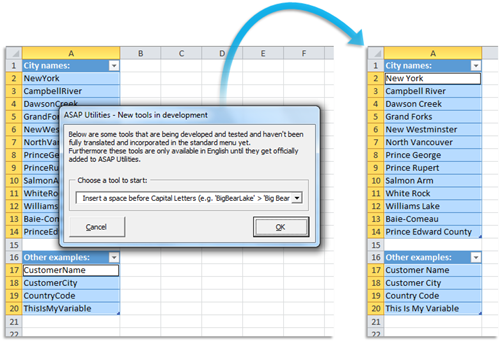 This will put a space in front of Capital letters in the text in your selected cells. For example "NewYork" becomes "New York". This tool is smart enough to detect when a space should be inserted and when not. 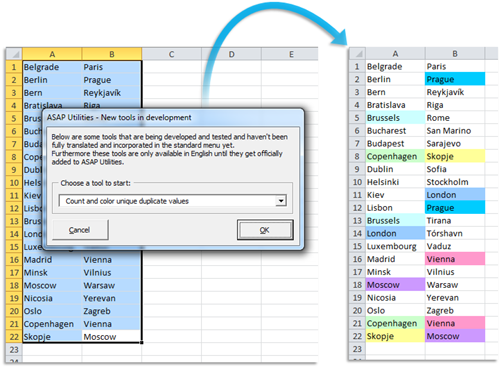 New option to choose if the data should be copied/pasted as 'values' or 'formulas'. If you choose 'formulas' then any formulas will be copied as they are, just like a regular 'copy and paste'. This has been how it always was in this tool, before you could make this choice. Greek accented characters have been added. 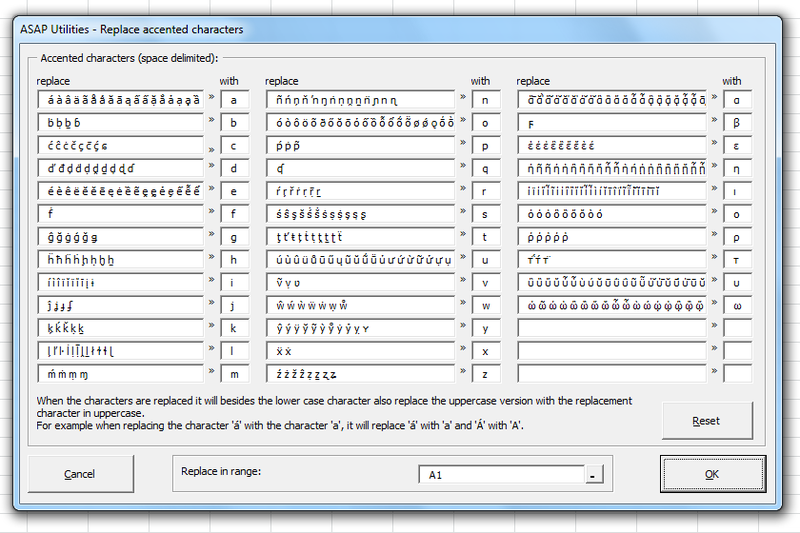 Now also supports (all) Unicode characters (except when you run Excel in Windows 2000). 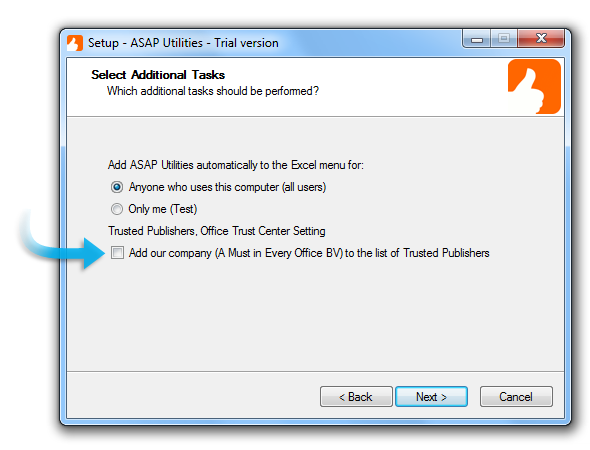 During the setup you can now have our company (A Must in Every Office BV) automatically added to the List of Trusted Publishers in Excel. Some people have their security settings set to only allow macros run by Trusted Publishers, and then this can help. The tools from ASAP Utilities are now easier to add to the QAT (Quick Access Toolbar) from Excel 2013/2010/2007. Besides the existing way to add them to your favorites menu, we think that this might help to even further speed up your workflow. A few small improvements and a few spelling corrections. The combination of a filtered table and excluding hidden rows/columns from the export could result in an error. This is now fixed. Didn't work if the specified cell on the sheet was hidden. This is now fixed. Formulas that referenced to a cell with an error were skipped. Such formulas are now updated too. The combination of "Find/replace in: Range" and "Look in: Formulas", didn't replace anything. This is now fixed. 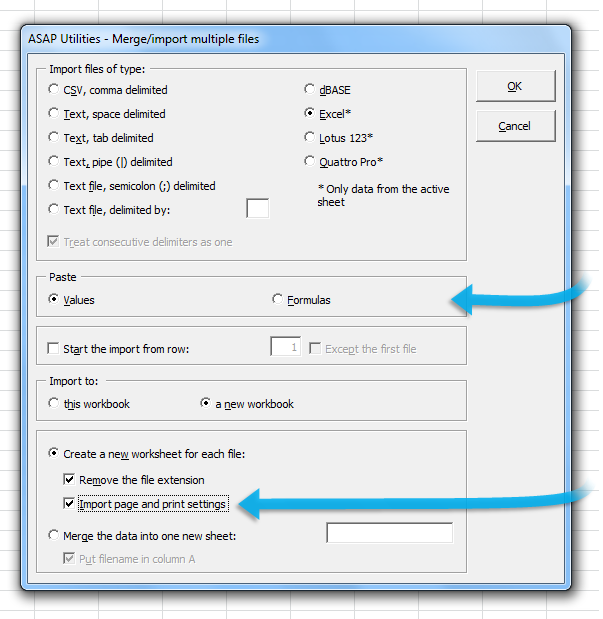 Formulas that referenced to a cell with an error or resulted in an error were skipped. These formulas are now updated too. Due to a bug in the Windows 8 64-bit edition (only this edition), copying to the clipboard didn't work. This is now fixed by using a workaround. If you had a formula with a large number which was formatted as a date, then this could result in an "overflow" error. This is now fixed. 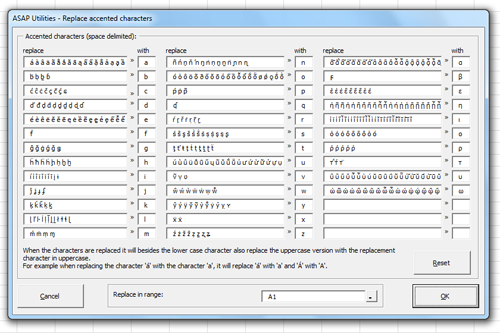 Any text after the % character was decoded or removed. This is now fixed so that it only gets decoded and for example SQL statements that use % are now preserved. The applied number format now shows the seconds too. If a zero (0) was left as the result in a cell, then it was entered as "text". This is now corrected so that it is entered as a number. 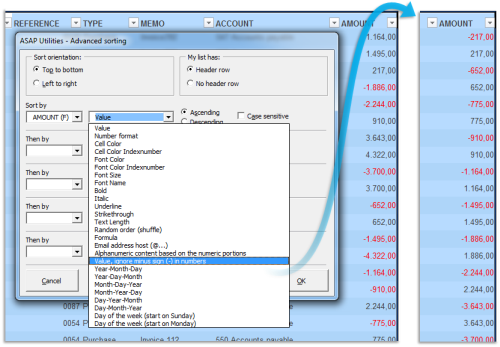 If you choose to "Create a workbook with these results" then the calculation results of the "Unique values" and "Values that appear only once" were switched. Speed improvement. In version 5.0 copying/preserving the row height on import was added, but it was slow for files with many rows. This is now fixed. Improved handling of merged cells. Didn't remember your last used settings. This is now fixed. The English term "wildcards" in the tools, has been replaced with the text "wildcard characters". 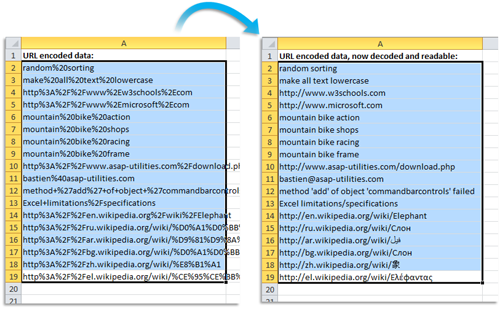 In Excel 2010/2013 some tools that edited data in a defined Table (a Table as via "Home > Format as Table" or "Insert > Table") on a worksheet with many formulas didn't run at the usual speed (sometimes it was even painfully slow). 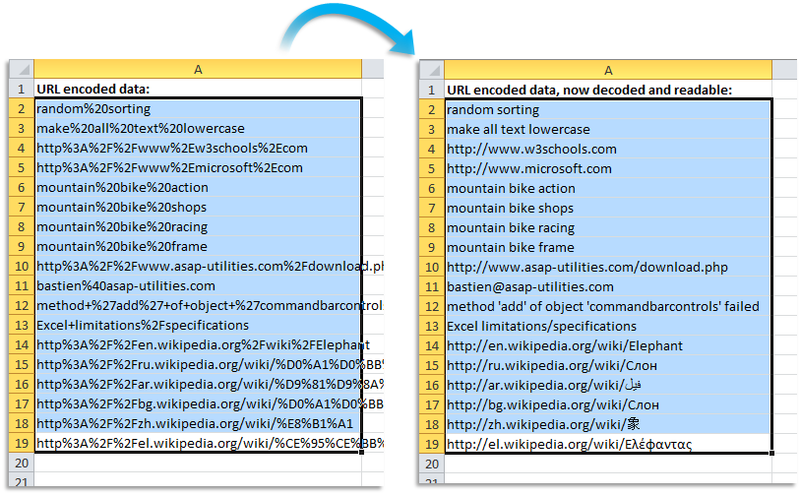 The speed difference could be huge compared to earlier Excel versions and compared to editing the same data when it was not in a defined Table*. This is now fixed by using a workaround for this Excel bug. 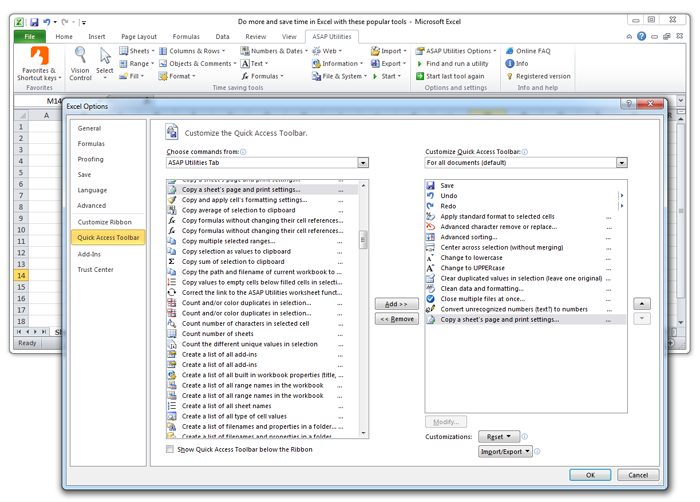 (*) a Table as via "Home > Format as Table" or "Insert > Table". A few small bug fixes and improvements. 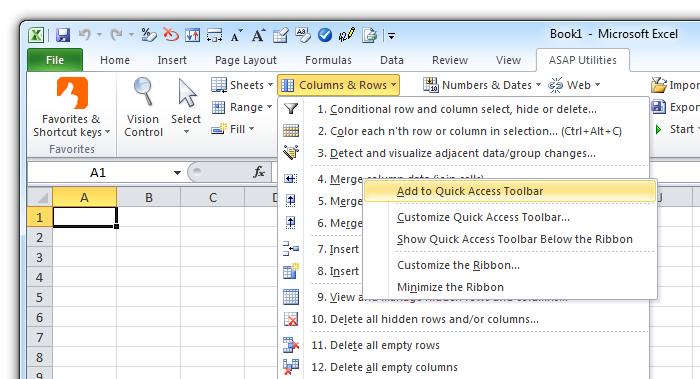 When Excel 2013, 2010 or 2007 is doing something in the background and the running tool from ASAP Utilities has to wait for this, then this message is shown in the status bar "Waiting for response from Excel...".